You know all those neckties you’ve bought for your dad or husband over the years? You know, the ones they get for Father’s Day, Christmas and other special occasions? Do they even wear those ties anymore? I didn’t think so. Lately, I’ve been cleaning out clutter and ran across a rather large pile of old neckties that are simply taking up closet space. 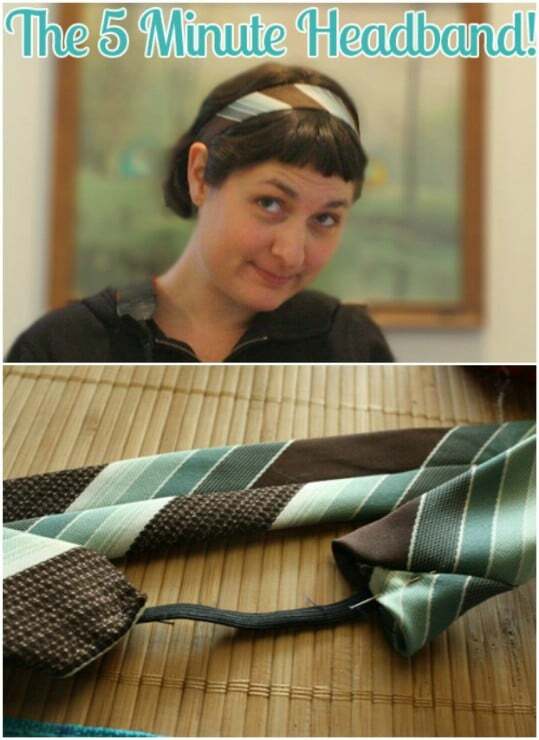 So, I set out to find some creative ways to repurpose those old ties and give them new life. What I found are 25 amazing repurposing ideas that will turn those old neckties into wonderful new things for your home and garden. First, let me say that if I can repurpose something, that’s what I’m going to do rather than throw it out or toss it into a yard sale pile. I love finding new ways to use old items and this list in particular has me really happy. That’s probably because now I have uses for all of those old neckties, which I didn’t think I would ever find. 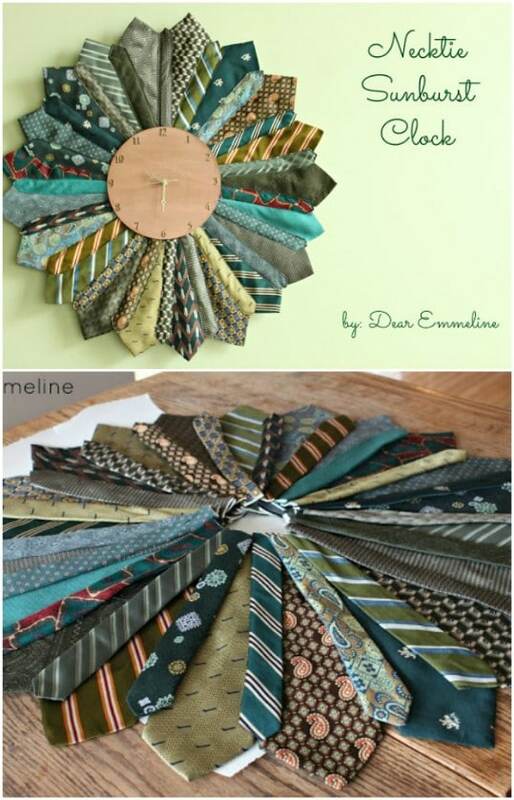 There are so many wonderful project ideas in here that will help you turn those old neckties into everything from clocks and napkin rings to jewelry and even a great t-shirt. Oh, and speaking of jewelry, if you haven’t checked out these 25 creative ways to repurpose vintage jewelry, you should totally do that right now. Now, back to our neckties. If you don’t have a stash of old ties that you can use, you can get these at thrift stores for little to nothing. I bought an entire bag of them a few years ago for a dollar. Plus, you can normally find them at yard sales or just ask your friends and family if they have any old neckties that they want to get rid of. You’re sure to be able to find ties for these projects without spending much at all. Some of them can be used to make such fashionable clothing, too. There is even a really great scarf, and be sure to check out these 26 infinity scarves that you can also DIY. So whether you have a stash of neckties on hand or just one or two that you want to repurpose, you’re going to find some fun and creative ways to do so. I hope you enjoy these projects as much as I have and I hope you’ll share which ones you have tried and which are your favorites. I found this gorgeous tie bracelet on Etsy but you could totally recreate the look if you prefer to DIY it. This one in particular is really pretty and has a wrap style with metal washer to tie it all together. If you prefer to buy instead of DIY, you can pick this one up for less than $15. 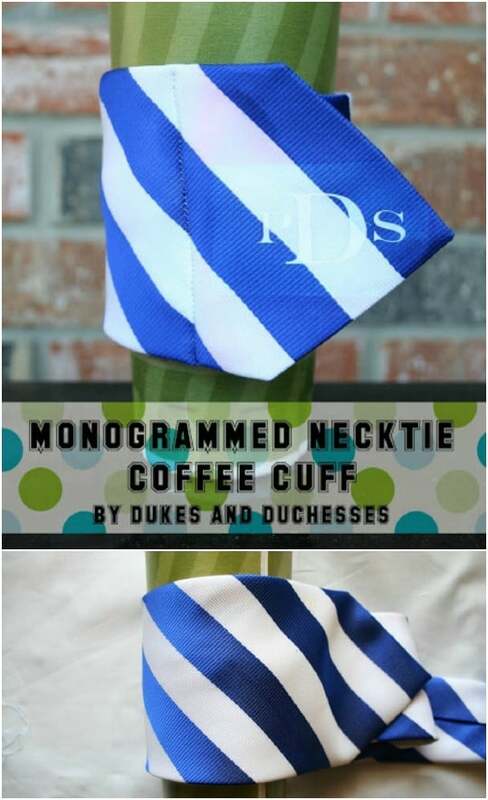 Turn those monogramed ties into amazing coffee cuffs with this project. You’ll need one tie for each cuff and if you don’t have any that are monogramed, that’s ok, too. You can add the monograming yourself. This is a pretty simple project and one that only requires a small bit of sewing. It’s also a wonderful way to get a custom coffee cuff and it makes a great gift idea. 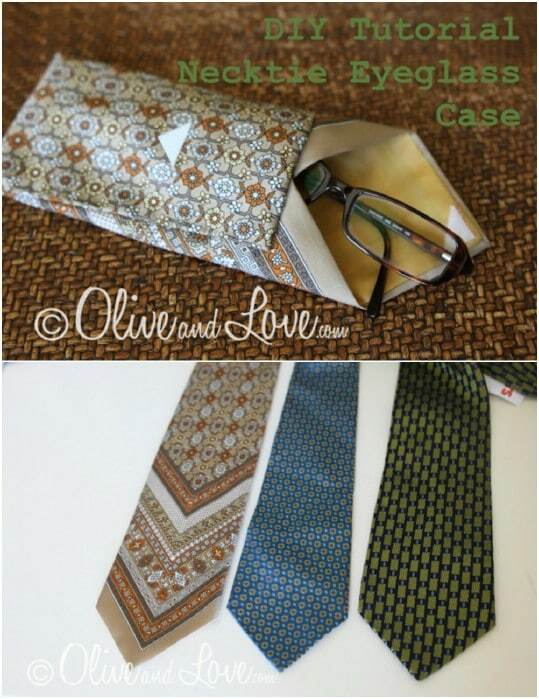 If you need a great glasses case, and you want to use up some of those old neckties, this is the project for you. This is a simple way to get a great case to protect your glasses and there’s absolutely no sewing required. 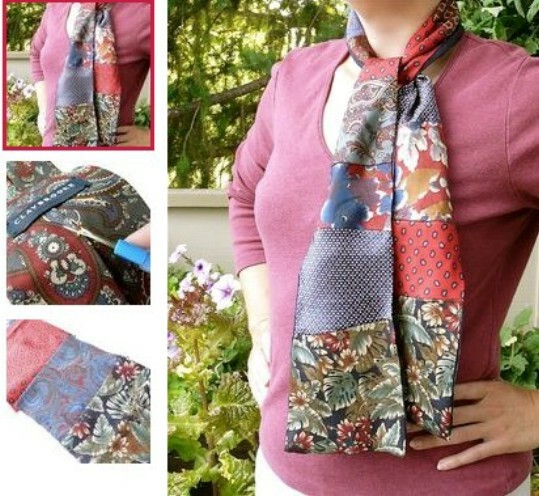 You can use fabric glue to hold everything in place, and since you only really use the end of the tie, you’ve got more tie to use on other projects. I love this lampshade that is made from repurposed neckties. What a wonderful addition to any den or man cave! You basically just use hot glue to stick the ties to a regular lampshade and then take the time to trim away those longer sections. The wide sections create a nice little ruffle effect and gives the lampshade a wonderful look. This zippered pouch made from a necktie makes the perfect coin purse or small makeup carrier. This one does require sewing but it’s mostly to put in the zipper. You use one tie for each pouch and they really are handy when it comes to keeping change and other small items organized. They would be perfect for kids’ school lunch money or any number of other things. 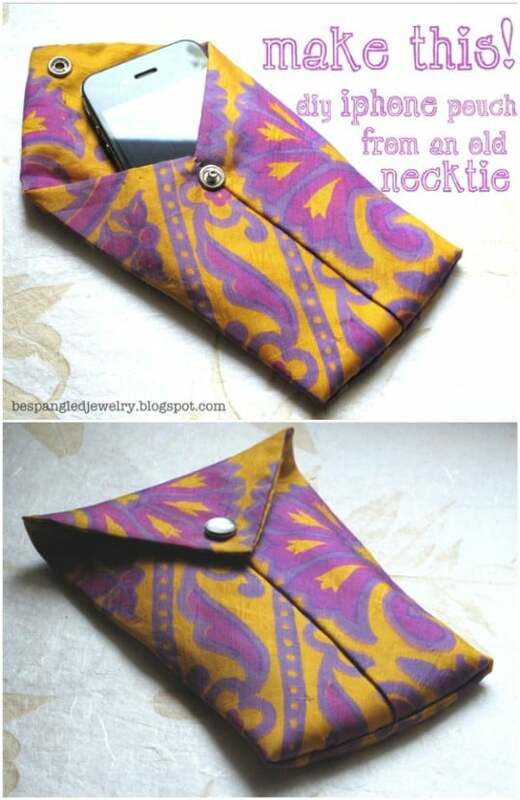 Make yourself, or anyone else, a wonderful pouch for their iPhone or iPad with an old necktie. Using the wider end, you simply create the pouch and then hold it together with a snap or even Velcro if you prefer. This is a pretty simple project and would be the perfect way to get the men in your family to better protect those Apple products. 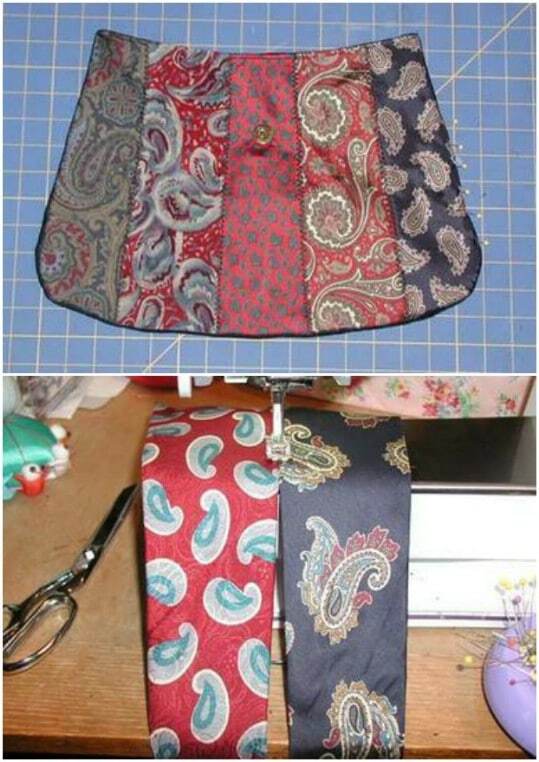 You can also use those old neckties to create stunning decoupage. This mirror may be my favorite thing ever. It’s so elegant with paisley ties, although you could also use character neckties if you wanted to create a theme. You just go over the mirror base with your pieces of necktie and then seal it all in with Mod Podge. Turn those old neckties into a really stylish bag for you or your little girl. You’ll need several ties to complete this project and you can choose ties in the same color scheme or mix and match for a really dramatic bag. This is a bit more complicated than some of the other projects on the list, but the end result is definitely worth the extra effort. 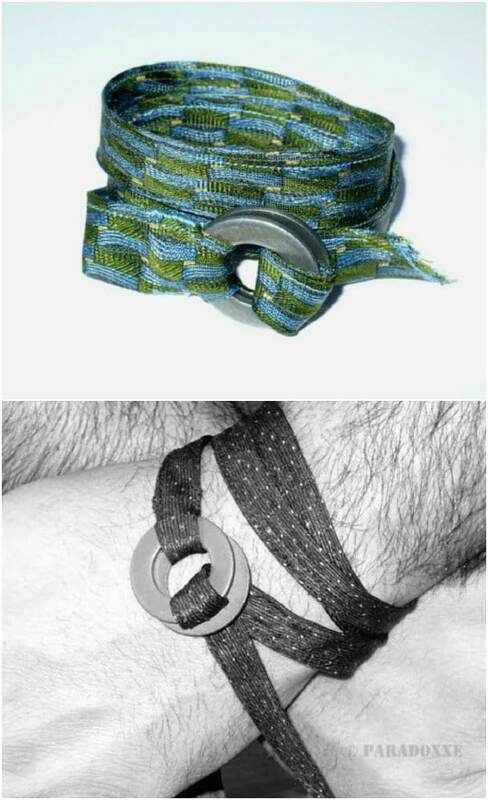 You could simply thread an old necktie through your belt loops and go for it, or you could make an actual belt using this really easy method. This is a great way to add some style to your wardrobe without spending half your paycheck. It’s an easy project that only requires a minimal amount of sewing. The belt is held together with a hook and eye closure, or you could just as easily add snaps or Velcro for the closure. This great hat has such a flower appeal to it. It makes you think of a fairy hat – think Tinkerbelle from Peter Pan. It’s also pretty easy to sew together and would be perfect for keeping your head stylish or as part of a fairy costume for Halloween. You just cut the ties down to size and then sew them together with the wide ends facing down toward your neck. 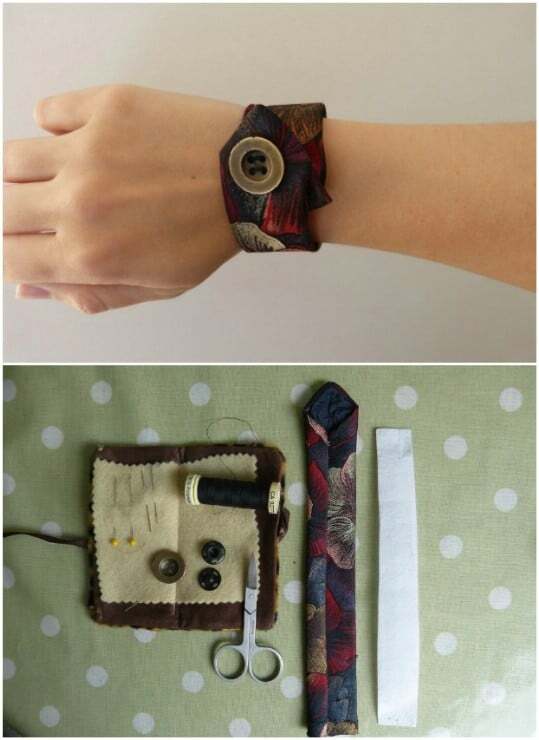 Here’s another wonderful bracelet that you can make yourself with an old necktie. This one has a great cuff style and is so easy to put together. Just cut the wider part away and fold the tie over, securing it with any number of buttons or other trinkets. There is a bit of sewing involved, but not much. You can easily have this done in short of an hour. A vintage necktie would make a beautiful vintage headband, don’t you think? I love this project and it’s great for little girls and big girls alike. You’ll need one tie for each headband, and it only takes about five minutes to make. You’ll add elastic to the inside of the tie fabric to give it that elasticity that it needs to keep your hair beautifully in place. Turn those old silk ties into beautiful luggage tags in less than an hour. You can create an entire set of these tags in an hour. 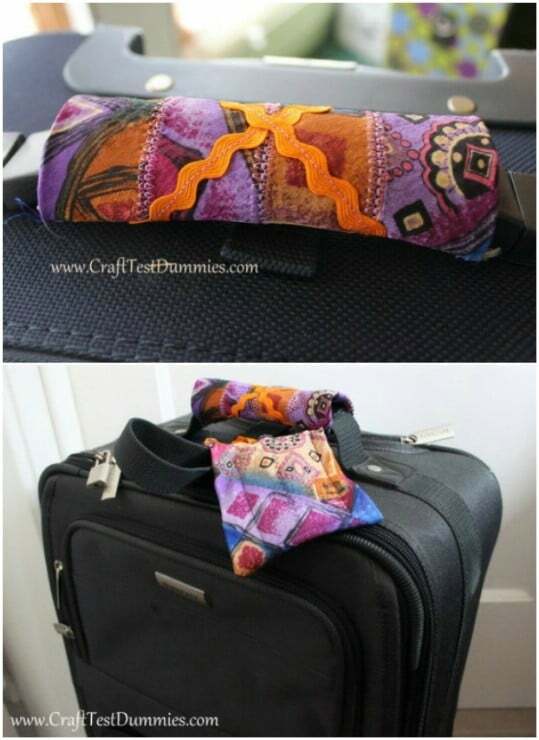 They’re so easy to make and they really do dress up your luggage in a beautiful way. If you have different sets of luggage, just use a different necktie to create a new tag for each set. You can make these amazing placemats and napkin rings from your old ties and really dress up your dinner table. 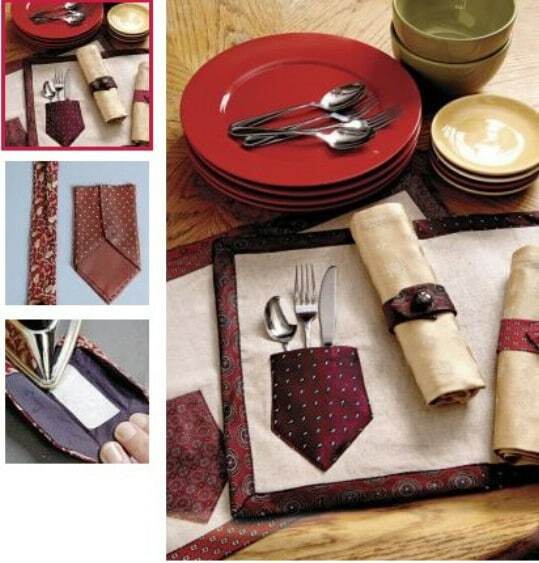 The placemats are lined in the necktie material and have a great little pocket – that looks like an actual shirt pocket – on the side for holding silverware. They just roll up and store away with the silverware already in them. Create a nice napkin ring to match each one with the leftover material. I love these flowers that are made from silk neckties. They can be used to decorate so many things from wreaths and vases to clothing and even shoes. They’re pretty easy to make too and you don’t have to sew anything. You just fold them into the flower shape and hold them all together with glue. You can create a beautiful, not to mention really soft, throw rug from those old neckties. You’ll have to do quite a bit of sewing for this one but it’s so much worth the effort when you see this beautiful rug that you’ve created. Use those old holiday ties that are nearly forgotten about to make a nice rug for the Christmas season or themed ties for other special occasions. Turn his old ties into something wonderful for you. This necktie scarf is colorful and bright – depending of course on the ties that you use – and it’s really easy to make. You can create all sorts of designs by mixing and matching your ties or just use those that are similar in color and design to create something elegant and classy. I absolutely love this one! It’s a little skirt made from old neckties and it’s gorgeous. You can use those old vintage ties that are really wide at the bottom to create a really great flowered look at the hem or use more modern ties for something that is a bit more A line. However you choose to create it, this skirt is certainly something to show off and is sure to get attention wherever you wear it. Use those old neckties to create a stunning wreath for your front door. This is great because you can use different colors to make a different wreath for all seasons. Use his spring and summer ties to make a warm weather wreath and Christmas or Thanksgiving themed ties, and those in darker colors, to make something for the holiday season. To make it, you just glue ties around a wreath form and then decorate. You can also use those silk neckties to create these elegant and posh pumpkins. These are great for decorating during the autumn months and they’re so perfectly adorable, too. Note that there is quite a bit of sewing required for this one but these pumpkins are too cute not to make, aren’t they? You could do them in brighter colors and have them on display throughout the spring and summer months as well. 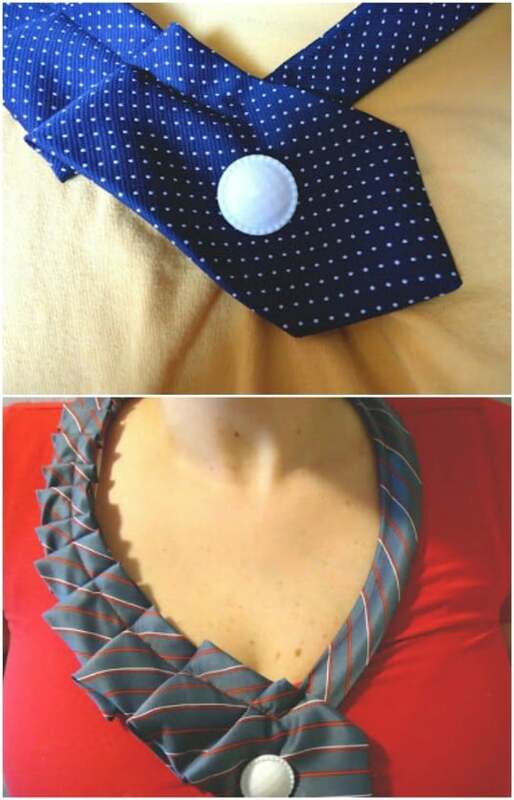 You’ll need a t-shirt for this project, as well as a necktie in a matching or even better, contrasting color. This ruffled neckline shirt is gorgeous and so much easier to make than it looks. It turns an otherwise ordinary t-shirt into something that you could easily wear to the office or out on the town, and since it’s so easy to make, you could do several of these in different colors and designs. This sunburst clock made from neckties certainly looks like something from the 1970’s, doesn’t it? You work in the sunburst effect with your neckties around a clock. I love the entire look of this and it seems so easy to put together. This would also make a wonderful gift for anyone who loves retro décor and would look great hanging in a bedroom or den. 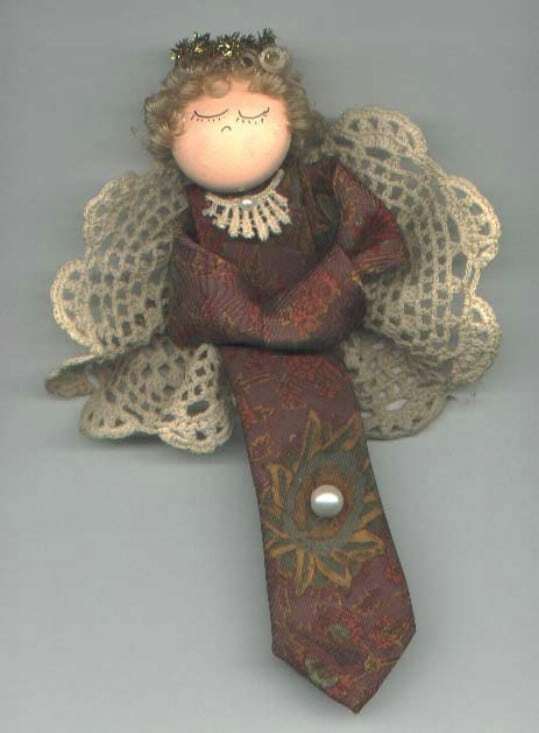 Make your own angel to grace the top of your Christmas tree or the center of your wreath this year with an old necktie. Actually, you can get two angels from each tie, a small and a large one. Use the larger one for decorations and the smaller one as an ornament or decorative pin. These are pretty easy to make, too and would be wonderful as gifts this upcoming holiday season. 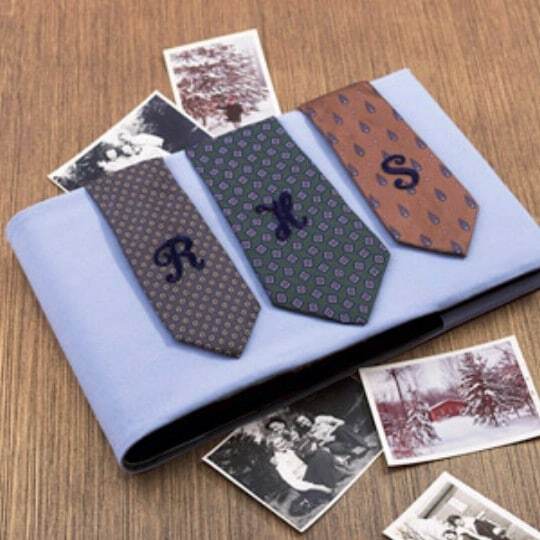 Turn an ordinary looking photo album into something customized and beautiful with your old neckties. This would be a great Father’s Day gift idea or could work as a groomsmen gift as well. You just decorate the photo album with the wide ends of your ties, choosing about three that are coordinating in color and design. It’s such an easy project and makes such a gorgeous photo album when you’re finished. 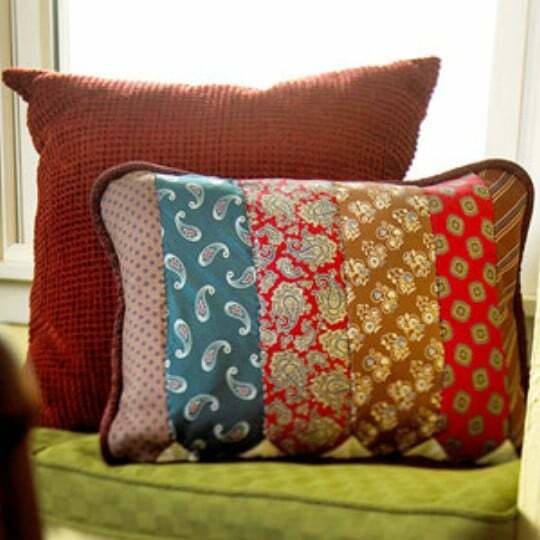 You can make a normal pillow look great when you add neckties for decoration. This can be a really simple project and would make a wonderful gift for the man in your life. Just trim your ties and use them to decorate throw pillows, or you can totally make the entire thing from scratch if you prefer. Great Ideas . Onew generally thought that neck ties are just thrown away after they become old or no more in the trend of things. These could be put to good use.